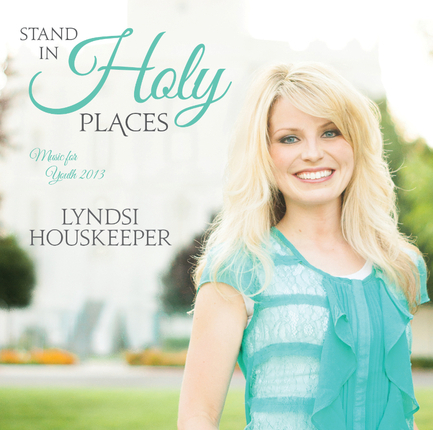 "Stand In Holy Places - Music for Youth 2013", the newest release from Lyndsi Houskeeper is filled with inspiring, encouraging music written especially for the 2013 youth theme. As an inspirational songwriter and fireside performer, Lyndsi has become a favorite of youth and women worldwide. This CD features brand new songs such as, What Will I Stand For, A Place That's Holy, Shoes, Harmony, and more. With Lyndsi's distinctive voice and her own special style, this powerful, personal music will strengthen testimonies and inspire listeners of all ages. Instrumental music is included for performance opportunities for youth at New Beginnings, Evenings of Excellence, and other activities. 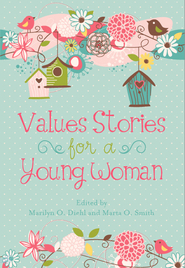 A special song, Share the Hope, inspired by the General Relief Society Broadcast is also included! Her beautiful melodies invite the spirit into our home. This cd shares such important messages. The melodies are so beautiful, calming, and invite the spirit into our home to make it a more holy place. I love how Lyndsi's music does this for our family. She is truly a gifted artist. We love her so much! I love Lyndsi's music. Her voice is so soothing and we love the inspirational and meaningful lyrics. I love that the instrumental tracks are also included so we can use them in church for performances! I would recommend buying this album for your daughter in Young Women's, and for the whole family. I've been listening to Lyndsi's CDs for many years now, and she never fails to disappoint me with her talent. Lyndsi has once again delivered a CD full of beautiful music that uplifts the soul. Perfect for any person young or old who is looking for some new music that will bring peace to your soul. Lyndsi Houskeeper is so talented adn that definitely shows in these songs! shes got a beautiful voice that always helps to bring the spirit! deifinitely reccomend! Lyndsi Houskeeper Does It Again! I have listened to Lyndsi's CDs for years now, and she never fails to disappoint with the quality of her music. Every song on every one of her CDs is always so well written in a way that will uplift your soul every time you listen to it. Pick up this CD now, and I promise you won't regret it! So inspiring and uplifting! Lyndsi has a way with reaching the soul through her beautiful melodies and lyrics. Love this CD! I love Lyndsi! She ha an amazing spirit and talent! I am blessed to have been introduced to her music. I have many memories so my son and I turning her music up loud and singing along with her amazing CD's! I am glad there is a new one to add to the collection!! !